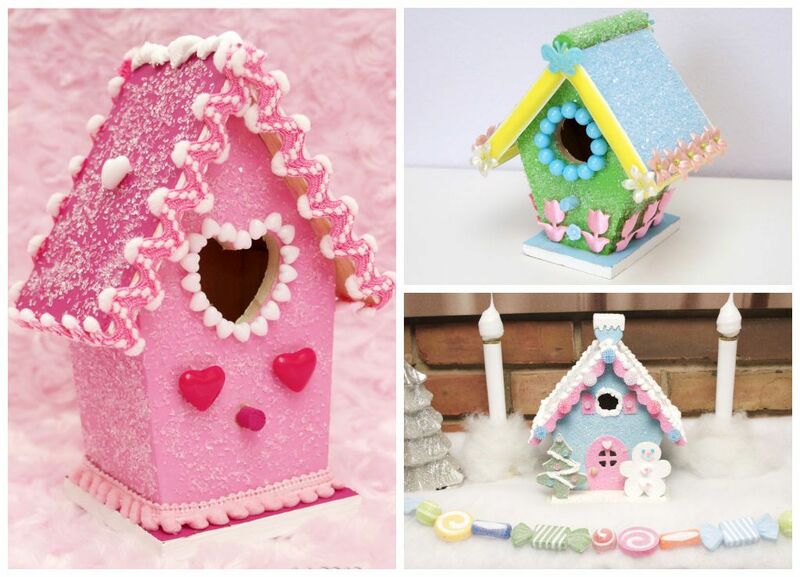 With Spring finally here, and Easter right around the corner, it's time to make some pretty projects to celebrate the season. 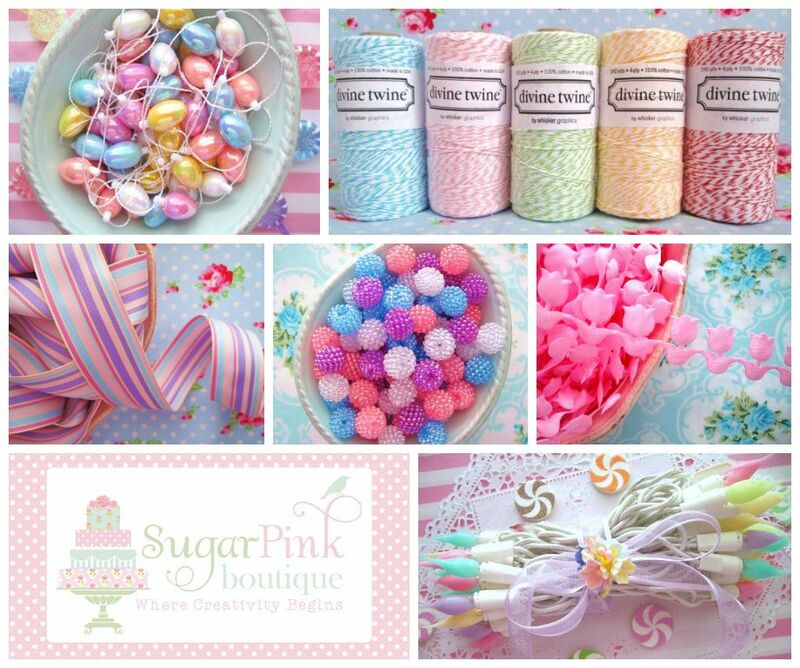 Today I'm sharing some of my favorite crafty supplies from the lovely Sugar Pink Boutique. These are the items that will take any Spring project from just nice to absolutely gorgeous. I've shopped here for years and it's my go-to source for special goodies. Or try this beautiful Miniature Easter Egg Garland. This would look so cute on an Easter egg tree! Easter Mix Berry Beads make festive jewelry and eye-catching embellishment for other projects like wine glass charms, candlesticks & more. I'm going to get some of mine out and make an elasticized bracelet for my little miss to wear. 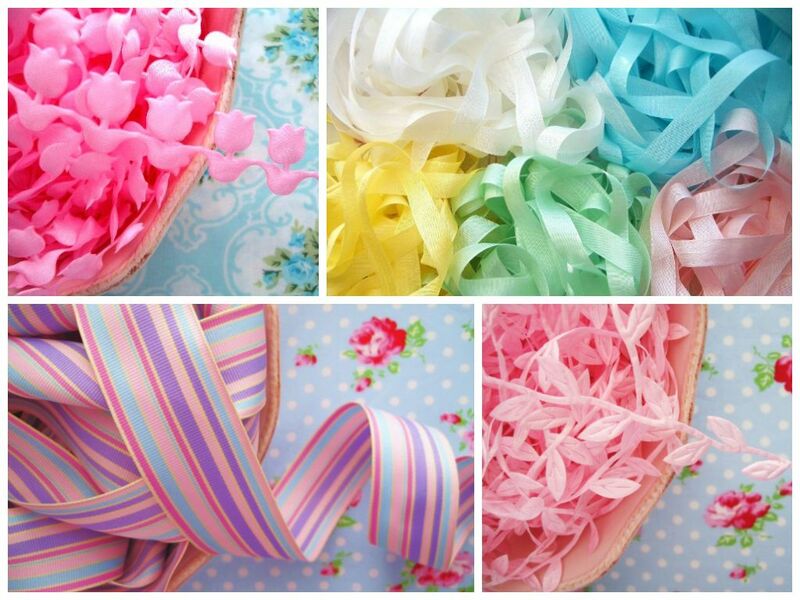 There's also a gorgeous ribbon selection. These Pink Tulip Cutouts, Pastel Striped Grosgrain, Sweet Pink Leaf Ribbon or Vintage Silky Ribbon Set can dress up the Easter baskets, make pretty hair accessories or tie up gifts. I purchased some of the Pink Tulip last year and plan to make some spring-themed hair clips with it. Sugar Pink carries a wide range of German Glitter Glass colors like this lovely Spring Green. This one is made with real silver so it develops a patina over time to look even more beautiful. There are loads of other great items too. Sugar Pink Boutique items always arrive quickly and beautifully packaged, so every order makes crafting feel extra special. Jennifer, the owner, is as sweet as her shop! You can keep up with all things Sugar Pink Boutique on Facebook, Twitter & Pinterest to keep up with the latest crafty goodies. Happy Spring Crafting! Wow! Those items are beautiful. Aren't they? I could drool over them all day! The Candylights are adorable!! Beautiful pictures too!! They are the first thing a discovered at Sugar Pink Boutique and I fell in love. They're so fab I couldn't believe they were really lights. I totally want frosting whenever I look at them!